Why can I call the Corporate Offices and Information Technology companies as Shops? : A Discussion on limits and extent of ‘shop’ with reference to “The Maharashtra Shops and Establishments Act, 1948”. The Maharashtra Shops and Establishments Act, 1948, is a legislation to regulate the conditions of work in shops and commercial establishments and have been in force in the State of Maharashtra since last 57 years. The first Shops Act was enacted in the year 1939. The Application of the Maharashtra Shops & Establishments Act 1948 is confined to municipal areas specified in schedule I and State Government of Maharashtra has extended the operation of the Act to other areas having population of more than 25000 people. 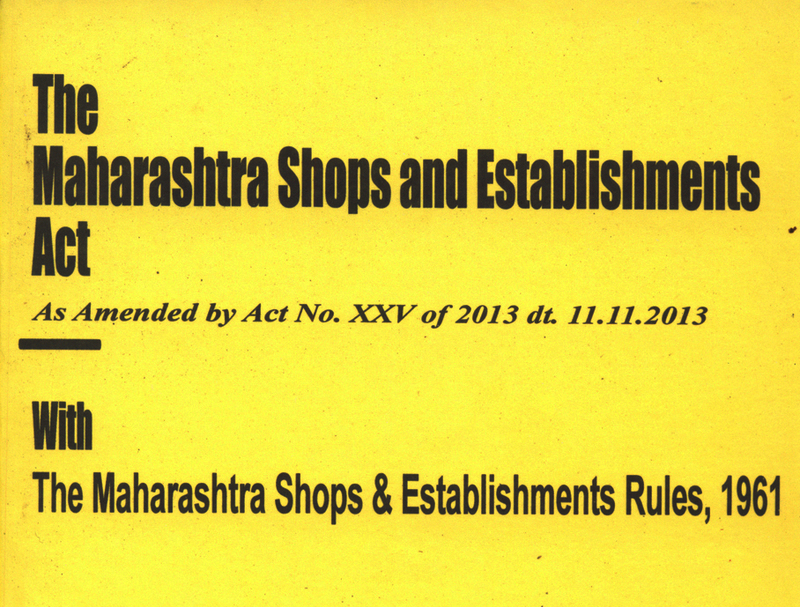 In an important amendment on date 1st Mat,1960, with the formulation of the Maharashtra state from the ‘Bombay State’, that the name of Bombay Shops Act was changed to ‘Maharashtra Shops & Establishments Act,1948 : and further this Act was extended to the State of State of Maharashtra state apart from Bombay from the year 1961. From the commencement of the Maharashtra Shops & Establishments (Extension & Amendment) Act, 1960, all the provisions of this Act shall come into force in each areas in which the central provinces and Berar shops and establishment act, 1947, or the Hyderabad Shops & Establishment Act, 1951 which was in force immediately before such commencement. Defining Commercial establishment: A commercial establishment means, “ an establishment which carries on, any business, trade, profession, or any work in connection with or incidentally or ancillary to any business , trade, profession and includes establishment of any of the following: (i) Legal Practitioners, (ii) Medical Practitioners, (iii) architect, (iv) Engineering firm (v) tax consultant (vi) Society registered under Societies Registration Act 1866 and does not include (a) a factory, (b) Shop ,(c) residential hotel, (d) restaurant, (e) eating house, (f) theatre or other place of public amusement. 2) Establishment : In the definition of ‘Establishment’, it specifies: (i) Residential hotel, (ii) Eating Place, (iii) Theatre, (iv) Place of Public Amusement and encompasses shops and commercial establishment over and above it and includes such other establishment as the State Government may by notification in the official Gazette declare to be an establishment for the purpose of this Act. 3) Shop: According to definition of Shop, it is specifically mentioned that, (i) Office, (ii) Store room, (iii)Godown, (iv)Warehouse, (v) Workplace, (vi) Premises used for trade or business. Referring to the definition as per the Act: Shop means, “any premises where goods are sold or where services are rendered to customers, and includes an office, a store room, godown, warehouse, whether in the same business or otherwise mainly used in connection with such trade or business, but does not include a factory, a commercial establishment, residential hotel, an eating house, theatre, or other place of entertainment. Although according to the definition of shop, it is an establishment where goods are sold or an establishment where services are rendered to customers, but it remains as a shop or commercial establishment only until it is not connected with manufacturing process. If a shop is connected with any ‘manufacturing process’ then provisions of the Factories Act, 1948 will apply to it. The Section 70 of the Maharashtra Shops and Establishments Act, 1948 has extended the operation of the Factories Act, 1948 and made it applicable to person working in the precincts of a factory to whom the Maharashtra Shops & Establishments Act, 1948 does not apply. Moreover, Section 70 makes it clear that a premise or precincts can either be a factory or a shop, and when conflict arises between defining the two. The Section 70 titled, “Persons employed in factory should be governed by Factories Act and not by this Act”. This section puts a limitation to the applicability to the Maharashtra Shops & Establishments Act, 1948 to a shop or a commercial establishment by the statement which quotes, “Nothing in this Act shall be deemed to be a factory to which the provisions of the Factories Act, 1948 apply” and “where any shop or commercial establishment is situated within the precincts of a factory and is not connected with the manufacturing process of the factory, the provisions of Maharashtra Shops & Establishments act, 1948 shall apply to it”. “Provided further that, the State Government by notification in its official Gazette, apply all or any of the provisions of the Factories Act, 1948 to any shop or commercial establishments situated within the precincts of a factory and on application of the Act to Shop or commercial establishment, the provisions of the Act namely The Maharashtra Shops & Establishments Act, 1948, shall cease to apply to it.”. Do the Offices and Information Technology companies come under the purview of Shops? The Section 2(m) of The factories Act, 1948, which defines ‘factory’ emphasises on the words, “manufacturing process”, and “industrial Establishments”. It has been held that on plain reading of explanation II ; which was added to Section 2(m) of The Factories Act,1948, with effect from 1st December 1987, it becomes abundantly clear that the Electronic data Processing Unit or a Computer Unit installed in any premises or a part of it, though may not satisfy the definition of Factory, as defined in Section 2(m) of the Factories Act,1948 but Explanation II grants exemption / immunity to Electronic Data Processing Unit or a Computer Unit , from being brought within the purview of the welfare legislations especially the Labour Laws. Thus, an establishment solely engaged as an electronic data processing unit or computer unit, though may be a factory, it would be exempted from the application of labour laws by virtue of Explanation II. This makes us think that it might be the Explanation II that might be the reason as to why the Information Technology companies that develop software or are into allied software services come into the purview of Sop Acts of the respective States. Further the question that might arise as to whether corporate offices –where no manufacturing process takes place – will they be covered under Shops & Establishments Act or under the Factories Act: What we can decipher from the discussion stated earlier above is that, if any corporate office is not in the premises or precincts of factory and is functioning separately, then it would be covered under Shops and establishments Act, but if the corporate office is within the premises / precincts of factory then it will be covered under the Factories Act,1948. A loophole that can be exploited which comes from the origin of the Shops Act – In most states, such as Maharashtra for instance, the act was passed in 1948, and in those times there was almost no internet, and the concept of virtual offices existed only in pages of science fictions. Since most start-up entrepreneurs today choose to initially work from home, or collaborate remotely with each other and virtual offices are not established under the Act, those remain out of the purview of registration. Supreme Court pronounced its judgement in the Case of “Seelan raj /vs/ Presiding Officer, 1st. Additional Labour Court (2001) 4SCC 634(2001) I L.L.J 1335.” The question in the case was to whether Data Processing and preparation of Software for customers is a manufacturing process and whether the place from where such a service is rendered is a factory, was referred by the Judge Bench to a Larger Bench. As to the relationship between the main definition and explanation II, the court pronounced that“ Explanation II does not control the main provision of Section2(m) of the Factories Act,1948. It merely sets out an exemption to make an exemption to make certain things clear like for example, installation of an electronic data processing unit or a computer unit in an establishment. The explanation says that a place will not be regarded as a factory if it is not otherwise so. Moreover as the physical process of “manufacturing process”, if not taking place in a place where an electronic data processing unit is installed, it does not come under the purview of factory; Information technology companies come under Shops and Establishment Act, as the word “Services” is mentioned in the definition related to the Act. Further in the era of E-Commerce, where goods are sold online through website and no physical shops exist on ground, the loophole that can be exploited is that there are no customers who are purchasing from any shop directly, hence no registration would be necessary. How true this will be is a question I put up to the readers of this article and leave it to them to ponder upon. If however, that e-commerce entity also entertains walk in clients and sell products and services to them, that loophole would no longer be available to such an entity. Thus we can say that it is due to these reasons that “Shop” is essentially characteristically different than “Factory”, and further that the dilemma begins – whether a premise is a Factory or a shop appears clarified distinctly.